Happening today: Google is hosting its first-ever partnership summit for publishers in Chicago, where executives like CBO Philipp Schindler and SVP of Ads & Commerce Sridhar Ramaswamy will be announcing new product updates. I'll be there to provide updates on the Axios stream. 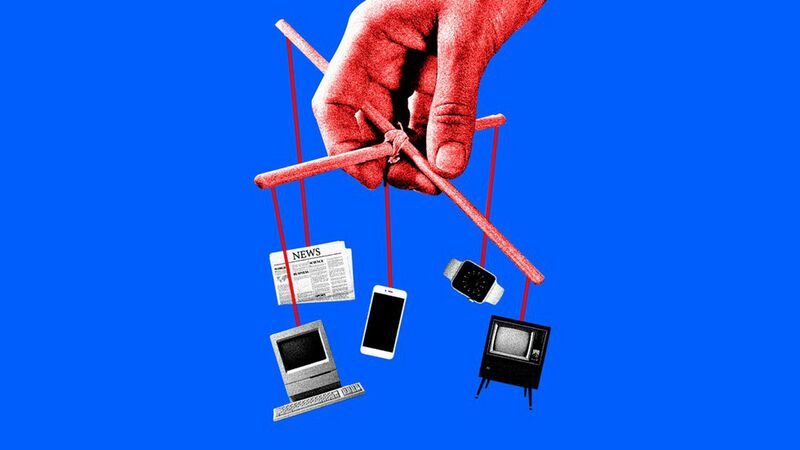 A global war against fake news is raging, and the U.S. — at the center of the mayhem — is being swallowed by it. Tech giants are creating new policies, but fake news still persists. Regulators want them to do better, but they're nowhere near a concrete policy of their own. The latest example: Within minutes of the deadly Las Vegas attack, fake news started circulating about the suspect and victims, forcing tech platforms to apologize for surfacing news from faulty outlets (more below). In the West: The Atlantic Council's Digital Forensic Research Lab writes that in Spain, Russian state-backed news organizations and bots "aggressively promoted digital misinformation and outright fake news about the politically charged vote" in Catalonia, Spain. This is in addition to fake news campaigns to meddle with elections this past year in the U.S., U.K., France and Germany. In the East: A new report from The Washington Post details how in India, false information spread through Facebook-owned WhatsApp has become "a part of everyday life," leading to violence, as well as religious and caste tensions. A Facebook spokesperson tells Axios it recognizes "this is a challenge and we're thinking through ways we can continue to keep WhatsApp safe." Why it matters: Nobody's winning the war against fake news, except maybe Russia (which is fighting on the other side). What's next: Governments globally are taking swift action to crack down on tech giants distributing false information, but while U.S. policymakers scramble to find solutions, no major reform has been passed ahead of the 2018 elections — where digital advertising and campaigning is already underway. Google issued an apology for 4chan threads in their top story unit and said it will "continue to make algorithmic improvements to prevent this from happening in the future." A Twitter user reported that an InfoWars article was featured in the "Top News" section of its breaking news collection on the shooting. BuzzFeed found over a dozen instances of fake news being spread online, many on Twitter, within just hours of the Vegas shooting, mostly from far-right sources. Why it matters: Tech platforms say they're taking action, but fake news is proving difficult to shake. That makes it harder for tech companies to make the argument that they should be able to police themselves. The outlier: Snapchat has remained virtually untouched by the fake news epidemic, a testament to its commitment to only distributing vetted partner content on its Discover platform. As Mashable noted last week, Snapchat is taking advantage of that position over Facebook by doubling down on hard news content. Facebook has made public some of the details it shared with Congress about the ads purchased by Russians during the 2016 election. It reported the information publicly shortly after it handed over the ads to Congress, likely getting ahead of any leaks. Reach and exposure: 10 million people saw at least one ad over a two-year period. 44% of the ads were seen before the Nov. 8, 2016 election and 56% were seen after. Roughly 25% of the ads were never shown to anyone, because Facebook ad auctions are designed to only reach people based on relevance. Cost: For 50% of the ads, less than $3 was spent. For 99% of the ads, less than $1,000 was spent, meaning that the majority of the $100,000 spend was poured into ~1% of the ads. Payment: Facebook says some of the ads were paid for in Russian currency, but it can't use that as an indicator of suspicious activity necessarily because "the overwhelming majority" of advertisers who pay in Russian currency aren't doing anything wrong. Targeting: Facebook says that most of the ads bought by Russians appear to focus on divisive social and political messages across the ideological spectrum — from LGBT issues, to race, immigration and gun rights — which squares with news reports last week. Most importantly, Facebook says that a number of ads appear to encourage people to follow Facebook Pages where they can receive more information in their News Feeds on these issues. Gut check: 10 million people saw at least one of the Russia ads over a two-year window, which likely isn't enough to actually influence one's political opinion. Rather, the bigger impact of these ads is that they often pushed people to Facebook Pages that spread misinformation or divisive news. The News Media Alliance, the trade group that represents thousands of newspaper outlets, will launch the second wave of its #SupportRealNews campaign today, which will call on the public to support real news by using trusted news sources produced by trained journalists. The campaign will feature monthly rollouts of print and digital ads targeted to officials, the general public and news organization employees in all 50 states. In total, the group is reserving $9- $10M in advertising space that Alliance's member publishers have committed to promoting the campaign — largely in full-page newspaper ads — over the next 3 months. The campaign is aimed entirely at news consumers, but it also aims to give industry employees the uplift of knowing that the industry writ large is fighting hard for the principles reporters care about. It also aims to educating consumers on how to recognize fake news and to point them towards trusted news sources. Google is ending its longtime "first click free" policy, which for more than ten years has allowed people to access content that was traditionally behind a paywall. Facebook is getting ready to launch its news subscription feature, which will likely support 10 or more free articles a month before readers are prompted to pay for content within its Instant Articles feature. But will it work? New data from Digital Content Next, a trade body that represents dozens of premium publishers, shows that social distribution does very little to drive subscription revenue for premium publishers. Early response from publishers has been positive. News Media Alliance CEO David Chavern tells Axios he thinks it's a "strong and good policy change." Robert Thomson, Chief Executive of News Corp says it's "an important first step." Why it matters: This shows that content providers like Disney can still win carriage fee battles over pay TV distributors, even if they carry costly sports channels and are losing subscribers at a record-pace. Per SNL Kagan data provided to Axios, the top 10 most expensive cable affiliate fees in the U.S. are all sports channels — mostly regional sports networks — with ESPN being by far the most expensive. What's next: Pay TV distributors can expect Disney and other networks to negotiate similar mega-retransmission fee deals. Consumers can expect their cable bills to continue to climb. Worth noting, the future of digital TV measurement: ESPN will work with Nielsen to now count linear TV and streaming audiences as one. Nielsen, which has been working to calculate better out-of-home-viewership, launched a new tool last week that will let advertisers better measure niche TV audiences. 7. DISH TV: "Altice could take ESPN down and survive it." "Five years ago that would not have been an option — that would've been suicidal. But today they could do it. It would be painful, but there's not any channel that I go to sleep at night that I say, 'If the price is too high for our consumers, based on our analysis, that we wouldn't be willing to take down.'" TV networks have been charging cable and satellite providers fees to carry their content for years, spurring fights like the one detailed above between Altice and Disney. But pay TV providers are continuing to boycott the fees being demanded of them, causing TV blackouts all over the country. With more consumers cutting the cord, the atmosphere has gotten tense. By 2022, SNL Kagan predicts that retransmission fees being charged by TV networks will increase by roughly 50%, reaching $11.6 billion. The latest — Puerto Rico blackouts: Local cable network Lilly Broadcasting removed its signals from DISH customers in the disaster zones in Puerto Rico and Virgin Islands. Per the NYTimes: Jeffrey Katzenberg — the longtime Hollywood executive and co-founder of DreamWorks Animation — "is trying to raise $2 billion for his new television start-up. That is likely to be the largest first round of financing in history for a digital media company that, at least at the moment, is only a concept swirling around in his head." Grab your gavel: The next round of conservative media regulators are officially settled in. The Senate confirmed Makan Delrahim last week to lead the Justice Department's Antitrust Division, where he will oversee media and technology mergers between heavyweights like AT&T and Time Warner. FCC Commissioner Ajit Pai was reconfirmed by the Senate Tuesday.